Today we are going to teach you how to make your own special holiday treat. Today you get to learn how to make peppermint coffee. I’ll admit it: I’m a sucker for anything peppermint flavored. Anything with a little minty kick automatically wins in my book. Whether you are looking to be a peppermint fiend, or to add to your holiday flavor repertoire, or just want to enhance your coffee, read on. The cool thing is, once you learn how to make this topping, you will not only know how to make peppermint coffee, but you can also apply it to hot chocolate, or almost any other drink. It depends on how much you plan on making at once. But, one cup of heavy whipping cream should have you covered for two drinks (or one mega drink… or three skimpy ones). Put that heavy whipping cream into a bowl and stir that mofo hard and fast for a few minutes. The whipping cream should start to get spiky if you are doing it correctly. Next, add in a squirt of maple syrup, or your favorite sweetener. If you use something thick like maple syrup, you need to make sure that it is getting spread throughout the mixture, and not clumping up in any single place. I recommend maple syrup only because it is a common household item that you already have. If you are already a regular Martha Stewart and have powdered sugar, Stevia extract, or anything along those lines, feel free to add them instead. The final ingredient is probably something you will have to make a special stop for, if it is not the holidays. If it is around Christmas and the new year, grab a candy cane you have lying around. Otherwise, go to the grocery store and grab peppermint extract. You need something to give it that minty kick, and peppermint extract is the easiest way to accomplish that. If you have actual mint leaves, I imagine that grinding a punch of them up would work too. In terms of quantity, about one half to one third of a candy cane per drink seems to be a good ratio. But, this is all subjective and depends on how minty you like things. 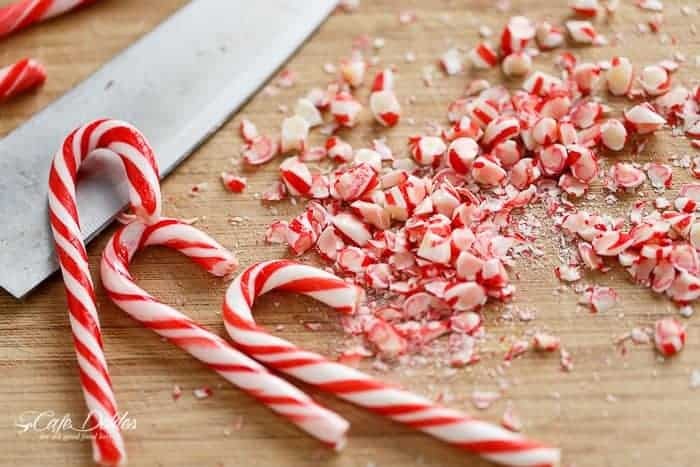 If you have a rolling pin and can grind the candy canes into a fine dust, that is ideal. Otherwise try putting them into a rolled up bunch of napkins, and grabbing a big and hard spoon and smashing down on it. Getting it into a fine candy cane dust is ideal in my mind, but heck, again this is subjective. If you like big chunks and candy cane shards, go for it. Now, add the candy cane dust to the heavy whipping cream and syrup concoction, and stir. Stir a minute or so until the whole mixture seems well-rounded. Now, prepare your coffee as you like, and simply add this on top. If you take your coffee black, try a smoother coffee flavor with a light or medium roast. If you normally add sweetener and milk and all of that to your coffee, just take into account that flavored sweeteners would influence the flavor even further. You likely will not have to dilute your coffee as much with milk, creamer, sugar, or whatever else you add to your coffees, once you try adding this mixture on top. Add to the top of your favorite coffee drink and enjoy! And there you have it folks. You now know how to make peppermint coffee that will be the envy of any Starbucks drinker. Enjoy. And, if you need a good coffee to go with this, check out Match Made Coffee. ← Does coffee increase workplace productivity?